Solar Carve Tower Rendering. Image Credit Studio Gang Architects. After consistent objections from community board and former City Council Speaker, developer drops controversial FAR request and is approved. William Gottlieb Real Estate can now move forward with development of Studio Gang Architects’ “Solar Carve” Tower, a ten-story structure that will occupy 40-56 Tenth Avenue, the full block between West 13th and 14th streets in Manhattan. William Gottlieb originally sought additional floor area to offset prohibitive construction costs resulting from poor subsurface conditions at the site, 10% of which is occupied by the High Line itself. Had the developer’s initial request for an FAR variance been granted, the proposed “Solar Carve” tower would have been 34% larger than allowed for by local zoning requirements. Prior to the developer’s submission of a fourth amended application, four public hearings took place between September 17, 2013 and February 11, 2014. William Gottlieb consistently argued in the prior applications that uniquely poor soil conditions at the site, in addition to the inconvenience of the High Line’s intersection with the site’s L-shaped lot, would generate exorbitant construction costs, which would, ultimately, undermine the project’s profitability. The developer presented evidence of a gasoline spill stemming from one of Manhattan’s few gas stations, located north of the site at West 14th street, which has caused subsurface contamination necessitating excavation of over 200 tons of soil from the site. Opposing parties argued that the site conditions were not so unique as to deprive the developer of a reasonable rate of return and that, therefore, the developer was able to comply with existing floor area restrictions. Opposition to Gottlieb’s applications was strong and both State Senator Brad Hoylman and former City Council Speaker Christine Quinn publicly denounced the development plan as did the Greenwich Village Society for Historic Preservation, the Greenwich Village Community Task Force, the nearby Standard Hotel and the owner of the adjacent High Line Building. Manhattan Community Board 2 recommended disapproval of the developer’s initial applications for increased FAR and, at each of the four hearings on the matter, the BSA directed the developer to reduce its request for FAR relief. After these unsuccessful appeals to the BSA, William Gottlieb submitted an amended application seeking only minor height and setback variances, dropping the FAR request altogether. Community Board 2 nevertheless continued to oppose the application, arguing that the site conditions did not pose a hardship unique to the developer because adjacent developments had cited to the same poor conditions in seeking variances. The BSA, however, disagreed, noting that a finding of uniqueness does not require that the site be the only one impacted by the condition causing hardship, but only that the condition not be typical of neighborhood building sites, lest the granting of multiple variances materially alter the district’s zoning. The BSA went on to suggest that this finding of uniqueness likely precluded a less favorable outcome for the community. 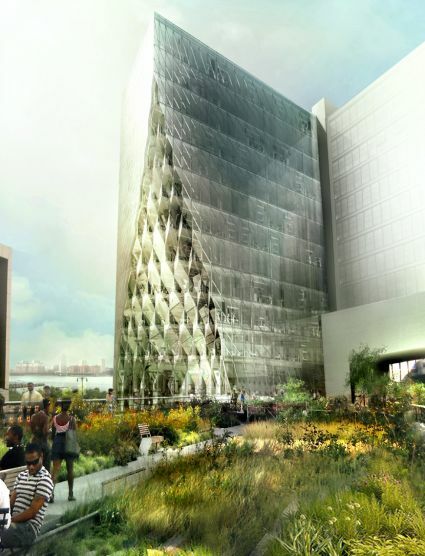 The BSA noted that an as-of-right building might have had greater impact on the High Line Building’s site lines than the developer’s amended design, which sets back from the High Line Building by approximately 16 feet. The City, which owns the High Line, decided to exclude it from the landmarked Gansevoort Market Historic District, leaving the sites along the High Line available for construction of developments that may obstruct its views. Subject to the developer substantially adhering to the architect renderings submitted with its amended application, the BSA granted a variance for construction of the ten-story tower, which will not comply with zoning requirements for rear yard, height and setback or with sky exposure plane regulations. Ultimately, William Gottlieb had originally proposed construction of a 12-story commercial building with a total floor area of 157,280 sq. ft. (6.68 FAR), but the developer will now have to settle on a ten-story building with floor area of 117,705 sq. ft. (5.0 FAR). Completion of the “Solar Carve” design is slated for 2015 and groundbreaking will occur after the Department of Building issues permits for demolition of the two three-story buildings presently occupying the site. BSA: 40-56 10th Avenue, Manhattan (299-12-BZ) (May 13, 2014) (Goldman Harris, LLC for 544 Hudson Street, owner). By: Alexander Talel (Alexander is a CityLaw Summer Associate and a Student at New York Law School, Class of 2015).